Enter the Gungeon is a top-down procedurally generated shooter which asks the age-old question of “what if everything was more like a gun?” It’s an irreverent and lighthearted game which is one of the most kinetic of its ilk, merging danmaku mechanics with interactive environments to carve out a niche in an increasingly saturated genre. This is a game with such a cohesive vision that the developer even named itself after the game’s iconic Dodge Roll – it’s a lot of fun with a hefty challenge and even more content slated to arrive in the pipeline. 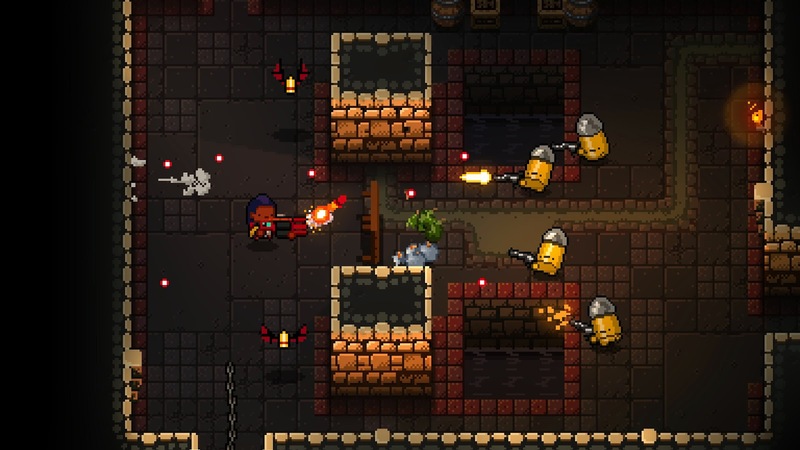 There’s a huge number of shooters on the Switch at the moment, both of the procedurally generated and scrolling variety, but Enter the Gungeon might just be the one you play the most. Related reading: Another couple of dual-stick shooters and "roguelikes" that might interest fans of Gungeon. The game’s premise is delightfully simple, giving just enough information to justify the enormous amount of shooting that is to follow. 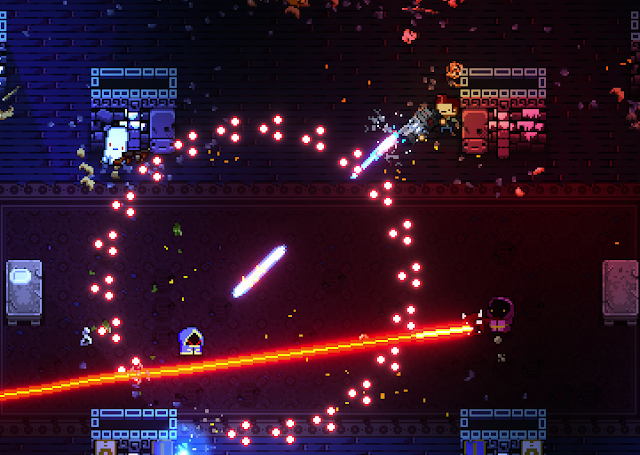 The player picks from a variety of characters, all arriving at the titular Gungeon in search of the Gun to Turn Back Time and achieve some personal goal. The Gungeon itself is built of many hostile rooms, filled with enemies that shoot on sight. Compared to games like The Binding of Isaac, the rooms themselves are constructed of far more complex seeds and give the image of various rooms in a castle, and their various shapes and sizes keep the combat encounters interesting. I particularly liked Dodge Roll’s decision to focus more on big enemies that take a large amount of hits, who fire intermittently in very deliberate patterns. It’s a very antithetical approach of most procedurally generated games, which algorithmically throw legions of cannon fodder at you. 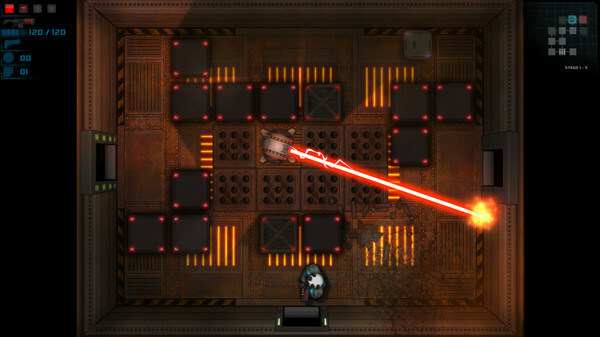 Even though the rooms are random, the player can still feel clever by luring big enemies behind walls to mitigate their impact, or circle strafe homing fire whilst keeping an eye out for the quicker foes. Every enemy seems designed to make the player adapt their strategy and keep thinking about what option they can use to overcome the obstacle most efficiently. 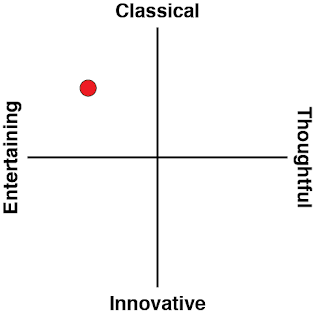 This also serves to highlight the sheer volume of different options the player is given over the course of a game. The protagonist’s sprite is small and blocky, but has a relatively slow movement speed that barely outruns some enemy bullets. They have access to a dodge roll which grants them a few seconds of precious invincibility (and an amazing tutorial which demonstrates just how to use it) as well as a blank to erase all bullet fire. Most rooms also have pillars which block bullets or tables which can be flipped either horizontally or vertically to create a temporary bullet shield. The player will also unlock a veritably enormous arsenal over the course of the game (there’s over 200 to collect!) and although each one has a limited ammo pool, it’s not difficult to come by refills. I did like how the more unique guns force the player to shake up their strategy to make the most of their newfound weapon, but I thought this was undercut somewhat by the existence of more conventional automatic weapons that just feel too natural. I had no reason to play around with helix-shooters or bomb launchers when AK-47 was an acceptable solution to nearly every problem I was faced with. Nonetheless, the random weapons are a blast to use if you commit to them, and further compound the game’s mechanical complexity. If there had to be one caveat, it’s the game’s rather steep difficulty curve. Each of the game’s damage mitigation options – the blanks, the table flipping, the dodge roll – will require some degree of finesse and timing to use effectively. Because the player is never allowed to stand still, or to take more than a quick moment to think about what to do next, the game’s overall feel is one of relentless twitchy action. It’s made all the more difficult considering that Dodge Roll is decidedly against rogue-like elements being used as a crutch by the player to gain avatar strength – in Enter the Gungeon, all permanent forms of character development need to be earned through completion of various in-game challenges, and tend to give the player more options rather than avatar strength. I can imagine a more casual player having trouble moving past the first boss and missing out a lot of the game’s eclectic content. The only real reprieve is the co-op mode, which lets a friend run and gun alongside you: this eases up the enemy attack patterns since their attention will be divided. If you’re a fan of shooters and relish the challenge, Enter the Gungeon is absolutely at the top of its genre. 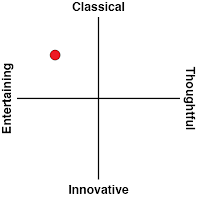 This is a game with meaningful, complementary mechanics and a tight gameplay loop which will have you playing for days. It’s one of the most effective uses of procedural generation I’ve seen in a long time, placing carefully designed enemies into dynamic spaces where the player is offered multiple options to overcome the challenge. I spent most of my time admiring just how clever Dodge Roll is – at least, that was when I wasn’t frantically trying to dodge imminent death via bullet.